George Bartlett Coggan was born in Aller, Somerset, in 1816 and baptised at St Andrew's church, Aller, on 3 June 1816. He was the eldest of the four children of yeoman farmer John Coggan (1791-1870), originally from Muchelney, and his wife Hannah née Cox (b1799), originally from Martock. George was living in Curry Mallet with his parents and siblings in the 1841 census. In 1846, at Langport, George married Anne Burge Maynard, the widow of James Maynard. However it appears to have been a very strange (if not strained) marriage since by the time of the 1851 census 34-year old George was back living with his parents in Curry Mallet where he was listed as married but for his occupation he stated "nothing at all". 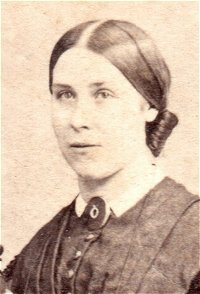 Ann Coggan and her daughter, Harriett Maynard (by her first husband) are shown as residing separately from George in 1851, 1861 and 1871. Ann is described as landed proprietor in 1851 and 1861, and she and her daughter are listed as annuitants in 1871. George seems to have lived a roving life with a disparate range of jobs and in 1851 he was made bankrupt. The bankruptcy proceedings, published in the London Gazette's edition of 2 September, outline his wanderings "George Bartlett Coggan, Schoolmaster, now and for six months last past residing in the parish of North Curry, in the county of Somerset, keeping a Boy's School, and giving Lectures, and also acting as Agent for a Loan Society, previously residing at Curry Mallet, in the said county, and giving Lectures, previously residing in America, and in the year 1849 residing at Langport, in the said county of Somerset, in partnership with David Jarvis, and carrying on the business of a Draper and Grocer, an insolvent debtor...."
During the 1850s George became involved in the new art of photography but, once again, he seemed to move around a lot. He is known to have had a studio in Regent Street, London, before moving to 107 Friar Gate, Derby, in 1857 but moving on again in early 1858. In 1858 George was granted two patents. The first was for "Improved instruments to be used in the sensitizing and developing of photographic plates". The second was for his invention of "a new portable apparatus to be called a 'Stereoscopia,' for exhibiting stereoscopic pictures." It was also during 1858 that he was mentioned in 'The Engineer' in connection with his 'Stereoscopia' which transformed two images into one stereoscopic view effect. It was probably around 1860 that he moved to Yeovil and set up a photographic studio - the carte de visite below is from this period when he had studios at Yeovil and Shepton Mallet. Interesting that he describes himself on the reverse of the CDV as "Artist, Dentist, &c". 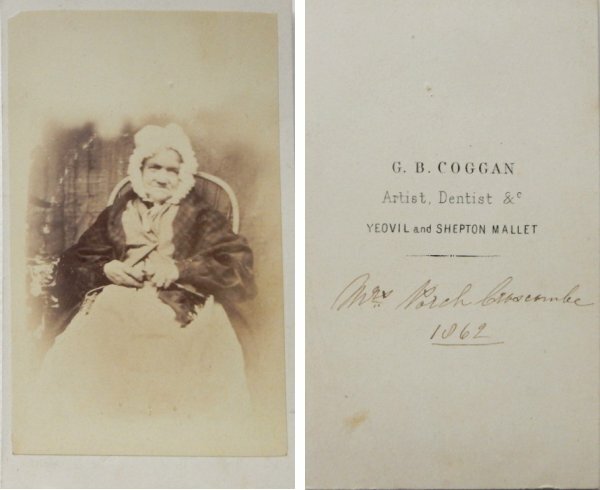 George Coggan was concurrently working in Magdalen Street, Glastonbury, practicing dentistry, apparently splitting his time between Yeovil and Glastonbury. However, by the following year he was running a photographic studio back in Yeovil - the CDV of the elderly man above is dated 1862. A carte de visite of an elderly lady, perhaps the wife of the man above (they are sitting in the same chair). The carte helpfully has the date 1862 - the same date as the carte of the man. 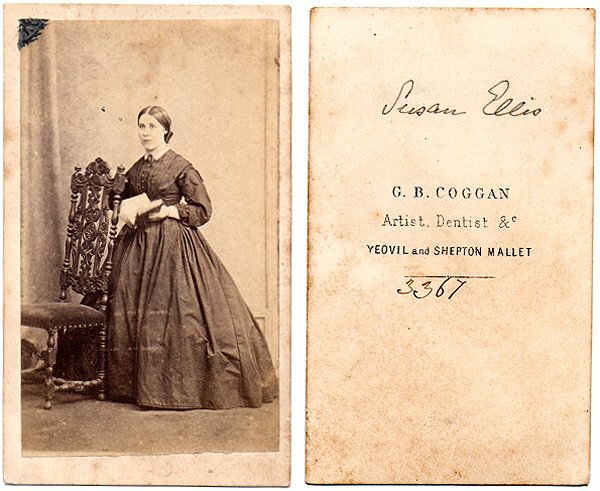 As a sidenote, this carte de visite is of Susan Ellis (1839-1903) originally from Halstock, Dorset, who, in the 1861 census (about the time of this photograph) was listed as a 23-year old servant living with and working for the family of bookseller, stationer and printer Henry Wippell at (today's) 1 & 3 Princes Street. At Halstock on 15 June 1862 Susan married soldier George Paul, eight years her senior and also from Halstock, where they lived after their marriage. They had at least one son, Walter, born in Halstock in 1863 before the family moved to Leeds, Yorkshire. They returned to live in Halstock by 1901. Susan died at Halstock in 1902, aged 73, and George died there in 1903 aged 82. 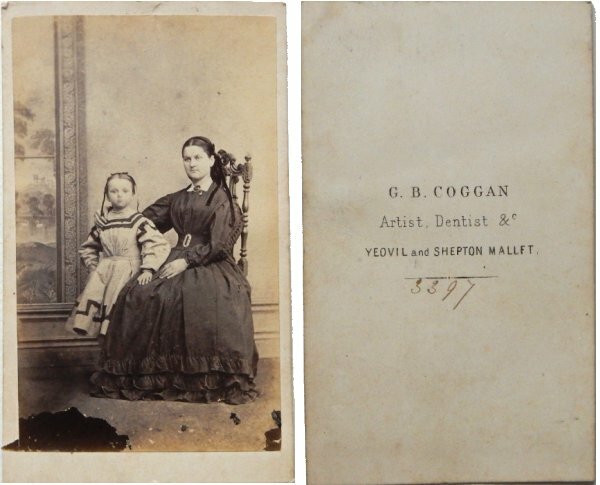 A nice mother and child portrait by George Coggan, probably dating to the mid-1860s. A map, based on the 1886 Ordnance Survey, showing the location of Prairie Cottage. The first advertisement below is from the Western Gazette's edition of 31 October 1863, and the second is from the 14 November 1863 edition. 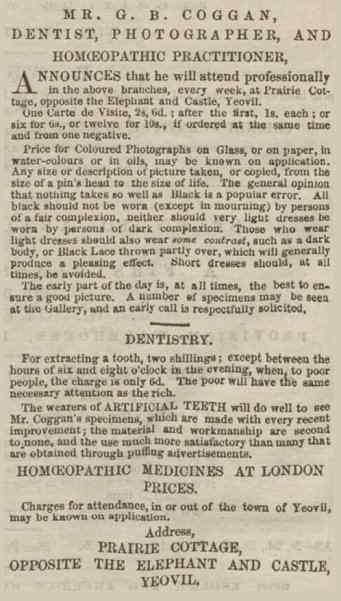 From the 14 November 1863 edition of the Western Gazette, this advertisement is most interesting for the photographer's suggestions as to what the sitter should wear for purposes of contrast, etc. in their portrait. In the Western Gazette's edition of 11 February 1865 it was noted, in connection with the proceedings of the Corporation, "A letter was next read from Mr Coggan, artist, Prairie Cottage, offering to give up to the Council one piece of land in exchange for another. The Town Clerk said the land which Mr Coggan asked for belonged to the turnpike trust. The subject was referred to the Mayor and Town Clerk for consideration." 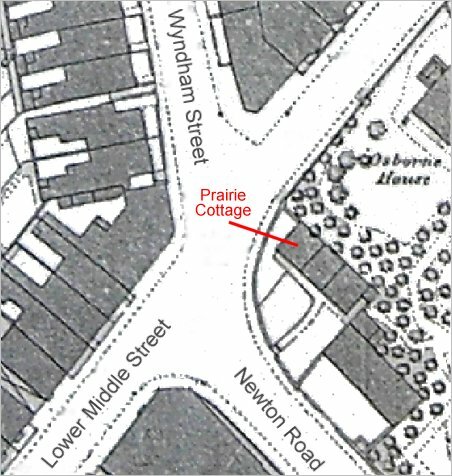 Coggan's address of Prairie Cottage was, from his advertisement above, in London Road (today's Lower Middle Street) "near the Elephant and Castle". It was almost certainly opposite the Elephant and Castle - the corner house of three cottages now the site of the old Western Gazette offices - since in February 1866 it was reported in the Western Gazette "A discussion ensued regarding the condition of the corner near Prairie Cottage, London Road, where a wall had been ordered to be built." Prairie Cottage was later occupied by John Chaffin. 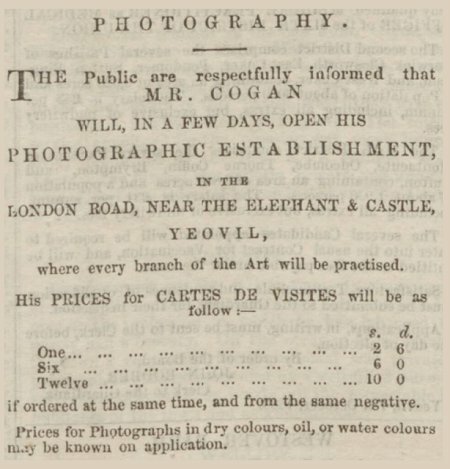 In 1875 he was listed as a photographer at Commercial Road, Shepton Mallet. By 1881 he was living at 9 New Wells Road, Shepton Mallet, still practicing as a dentist. In 1881 he married Matilda Sarah Wadge at Shepton Mallet but it appears from the following news article, from the 4 July 1884 edition of the Western Gazette, that even with yet another new occupation he wasn't happy. George Bartlett Coggan died at Shepton Mallet on 26 January 1887, aged 71. His will was proved the following May when it was noted that his personal estate was valued at £41 (about £18,500 at today's value).